SHANGHAI—W Hotels Worldwide, part of Marriott International, has unveiled W Shanghai – The Bund, marking the brand’s first hotel here and third in mainland China. Owned by Sinar Mas Group, the hotel overlooks the Huangpu River and features a bold style. Designed by G.A. Design, the hotel offers a mix of historic and modern influences, such as Hai Pai—the art of combining the old and the new, East and West. This is evident in both the hotel’s location, positioned between the Suzhou Creek and the Huangpu River, as well as the surrounding locale, where Art Deco buildings sit alongside Chinese mansions. Upon arrival, guests are greeted by neon light installations throughout the hotel’s living room. 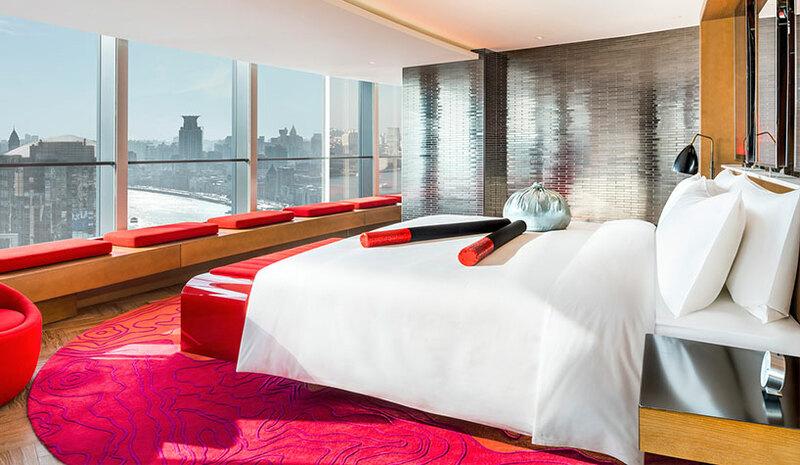 There are 374 guestrooms and suites, each appointed with the signature W bed topped with a pillow in the shape of Shanghai’s Xiaolongbao soup dumpling and chopsticks. Thirty-five of the rooms are suites, including the Cloud on the Bund, which includes highlights such as an LED wall and a hanging bed. The duplex Extreme WOW Suite—the brand’s take on the presidential suite—has more than 4,000 sq. ft. of living space, along with a hanging neon installation. All rooms have a switchable privacy glass and Nespresso coffee machines. Elsewhere on the property, there are five places to socialize and dine; nearly 64,000 sq. ft. of meeting and events space; an Away Spa; and 24/7 fitness center.